Today I'm sharing some incredible gifts I have received from friends. I can't believe how blessed I am. These are in the order in which I received them. This first package came from Erika. You can see she also thought the purse she made me would be perfect for T time. I love everything about it and all the lovely gifts I'm going to share below. The wrapping paper is double sided, so you KNOW I'm keeping it to use in my art this year. It's always good to start my day with "a cup of white black java." Of course, there were gifts inside the purse, too. Look at all the beautiful goodies Erika sent me. 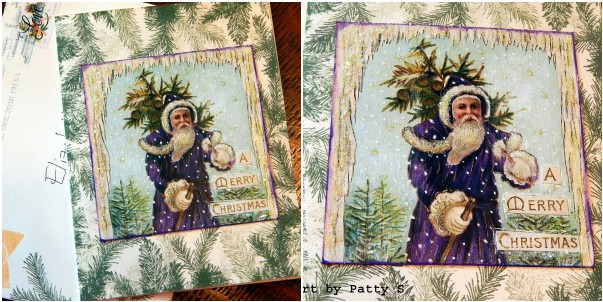 This gorgeous card came to me from Patty S, who many of you remember used to share T with us. In fact, she was the one who encouraged me to start this weekly event after the previous host quit without letting anyone know. Can you believe Mia? You saw all the beautiful and wonderful gifts she sent last month, and now she has sent more. 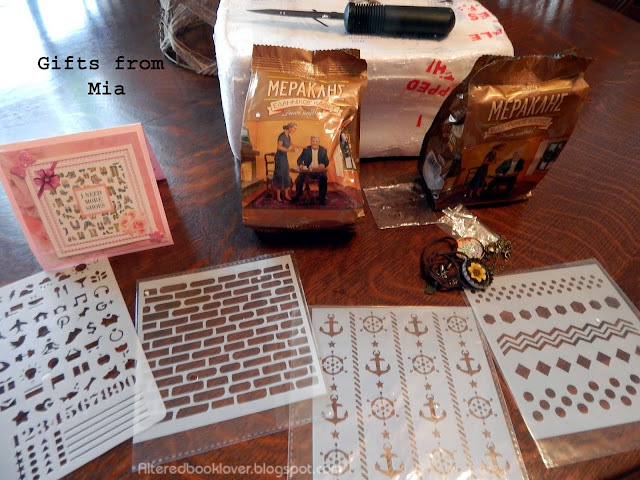 Although she had NO idea I was allergic to metal touching my skin, when she found out (and learned I don't have pierced ears), she sent this second gift box filled with love, stencils, a card, lovely necklaces, and COFFEE!!! 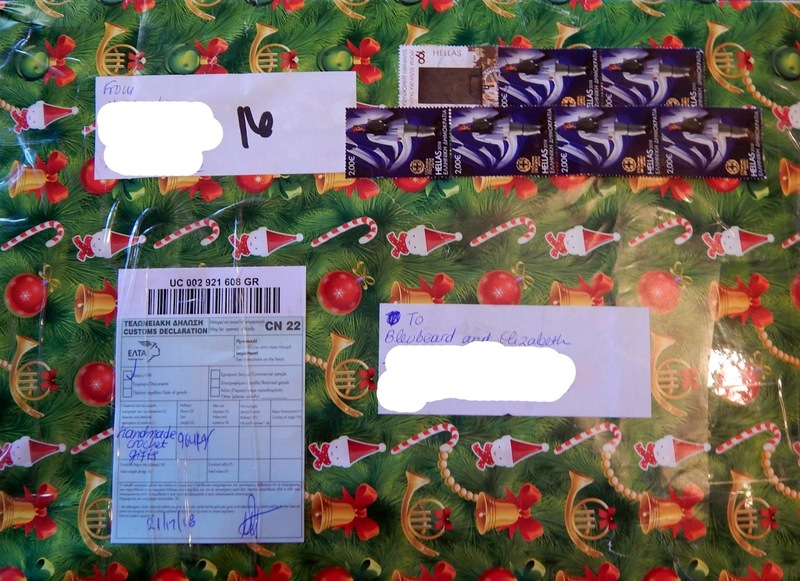 Although part of the package had caved in and had to be taped by USPS (our postal system), nothing was damaged. I can't wait to drink some Greek coffee. And look at all those awesome stencils. You know I'll be using those. In fact, I used one in my December calendar. I told Mia I had wanted one of those brick wall stencils forever. Now I can't wait to use it. The jewelry was hand made by Mia, too. Next up is this wonderful handmade card by Eileen. I'm sure many of you have seen it on her blog, and now it's all mine! I was also in LOVE with the flan postage stamp. Flan is one of my favorite desserts. I could eat it all day long. Next up is the package I received from Chris who always sends wonderful cards and incredible ephemera I can use in my art. Don't you just LOVE those wonderful art related napkins she sent? I was ready to put my Christmas decorations away. The rest of these cards are from non-artist friends. It's amazing, because I only sent five cards and four tip-ins this year. I still owe lots of friends, if nothing else, a thank-you card. My final gift simply BLEW (or BLEU) me away!!! Any guesses? Yes, Mia sent me a THIRD package letting me know there was no metal at all in this gift. She promised this was the last gift, because I was starting to feel very, very guilty. There will be tea on Tuesday, and crochet in my art. Most everything was handmade by Mia, except the spray mist she included along with something I really NEEDED. One of the items she sent was the spiral notebook filled with watercolor paper which is the perfect size for my calendar pages. That means I won't need to buy a calendar next year, so thank you beyond belief Mia. You have NO idea how you have touched my heart. Of course, I am so proud of all the gifts and cards I have received. I really DO NOT deserve them, but I assure you that I am so grateful to all of you and your kindness. Thank you Erika, Patty, Eileen, Chris, and Mia for your kindness and generosity. 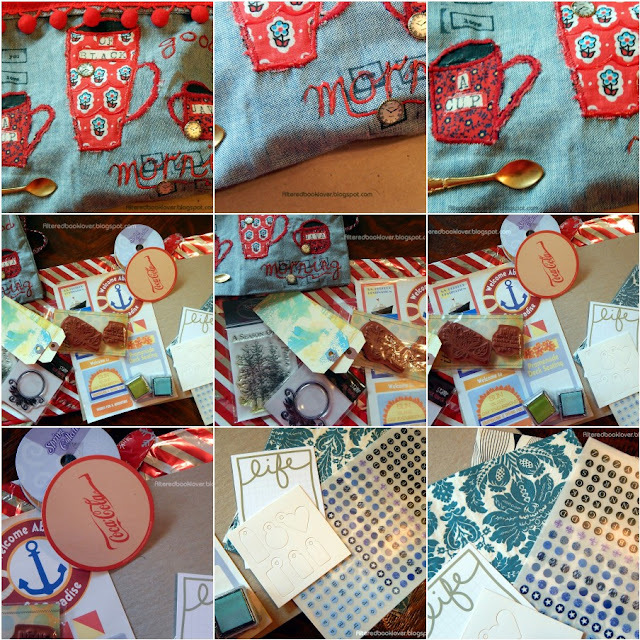 And in case you missed the first set of gifts I received, you can find them here. They were sent to me by Kathy, Linda K, Sharon, Halle, RO!, Cindy, my friend Ed, and Mia. It's now time for you to share your own drink related post. 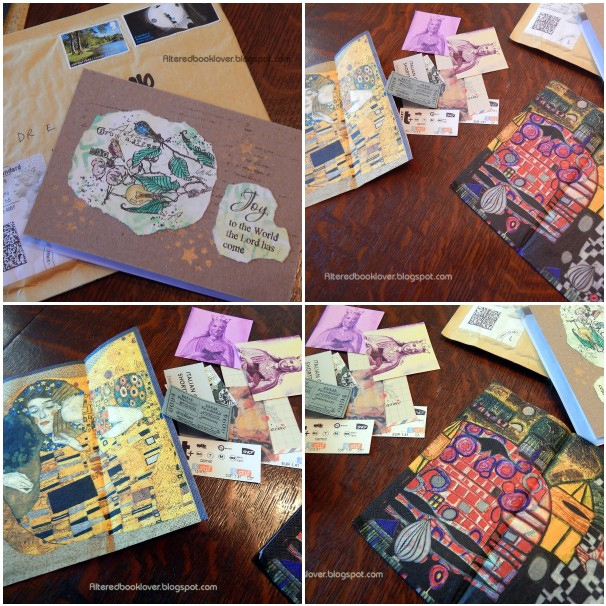 It can be gifts you received, photos, a place you visited, movies, postcards, books, sketches, mixed media, drawings, paintings, tags, scrapbooking, or other art that is digital, hybrid, or traditional, as long as it in some way relates back to a drink, any drink. Regardless, please share below and Bleubeard and I, along with the rest of the T gang will be by to visit. Please link only your T post and not your blog in general. Old photos are acceptable because they may be taken any time, not just on Tuesday and not just this year. well, somebody told santa you were good:) wonderful gifts! and i remember patty and miss her in blogworld. What a wonderful tea themed bag (full of of goodies) from Erika. Mia's gifts are beyond generous and thoughtful. Enjoy your Greek coffee! I wonder where Chris gets such great napkins for collage. Love the Klimt! Personally, I wish I could send you some real flan. You are very appreciated and loved for all you do, Elizabeth. You received an awesome selection of gifts, I'm sure you are going to enjoy using, as well as treasuring them. 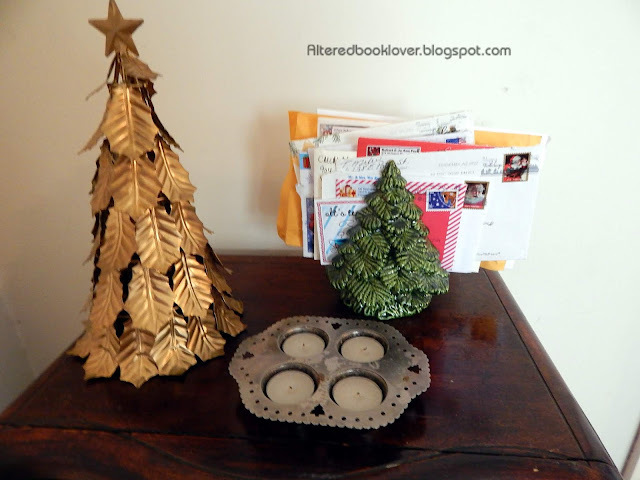 Enjoy your coffee, you know we all love to visit with you here, on your very welcoming Blog home. What a wonderful and thoughtful collection of such creative gifts! Ah, these women know you well! (And it's nice to see something from Patty. I miss her blog and art!). I'd say you hit the jackpot! 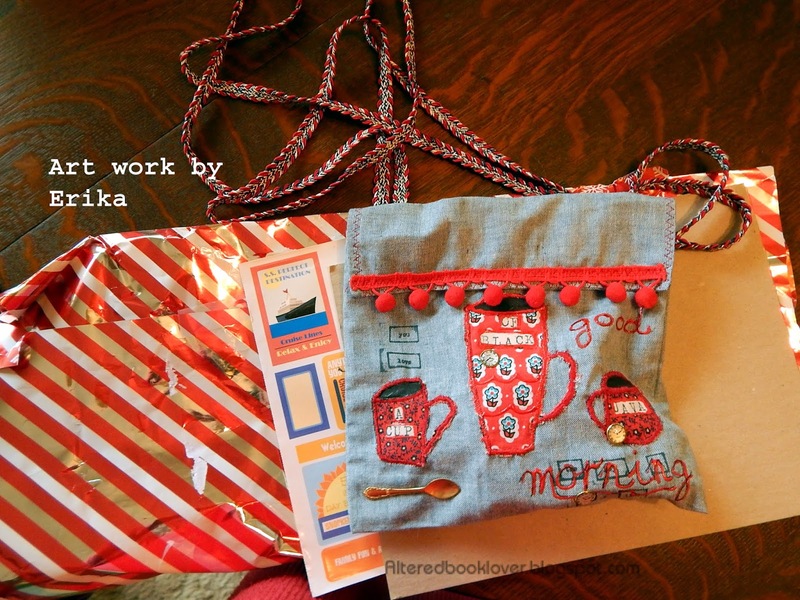 And that wee bag by Erika is a special gem! Wow, you certainly have been spoilt with so many gifts. It must be such fun opening parcels from faraway countries. And the little T time purse is just perfect! We shall be looking forward to seeing some of those little bits and pieces in your art. WOW! Blessings upon blessing came your way. What a wonderful stash to play with this next year. What wonderful gifts! You have a lot of talented friends! I love those stencils. Ha ha we were just talking of stencils! BTW, I don’t know what I did wrong, but I finally just published my post as it never did it. I waited until after 5:30; just in case. I will try again next week. Thanks .elizabeth for everything! Elizabeth, I so enjoyed seeing all of your amazing gifts. You have so many wonderful things to add to your stash. I look forward to seeing what you make with all of these lovely things. How very generous everyone was. 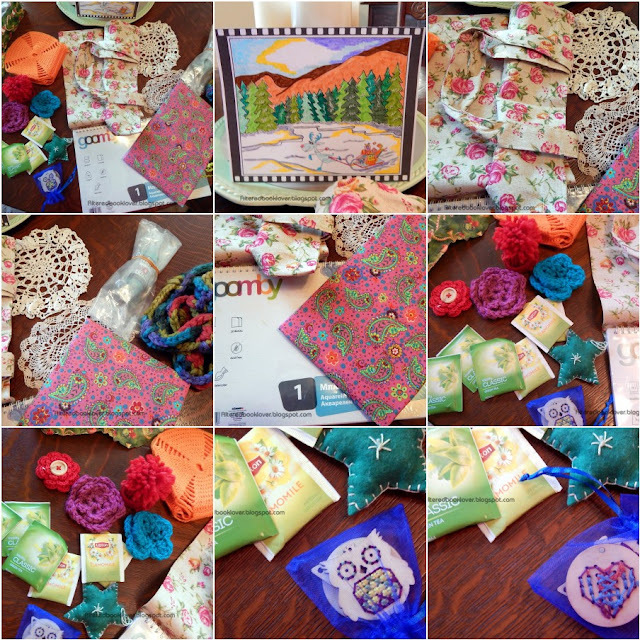 oh what beautiful and touching gifts you have received! I know we will be seeing lots of the ephemera and stencils being used quite a bit- and that brick stencil is a very favorite of mine:)There are so many kind hearts all around- you included. Soak in all that love. Happy T day! Of course you deserve all your gifts, my dear friend. Enjoy!!!!!!!!!!!!!! Hugs and kisses, sweetie!!!!!!!! You have been spoilt with AMAZING gifts and you DESERVE it Elizabeth! Enjoy all this wonderful supplies and treats ! We can see how much the girls LOVE you! We love you all and we are so grateful for having such a caring friend !You are simply the best! So lovely of Patty to send a card as well. I miss her in the blogworld. She posts very much of her wonderful art at FB and instagram - but I don't look there very often as those platforms just make me nervous with so much things going on there. 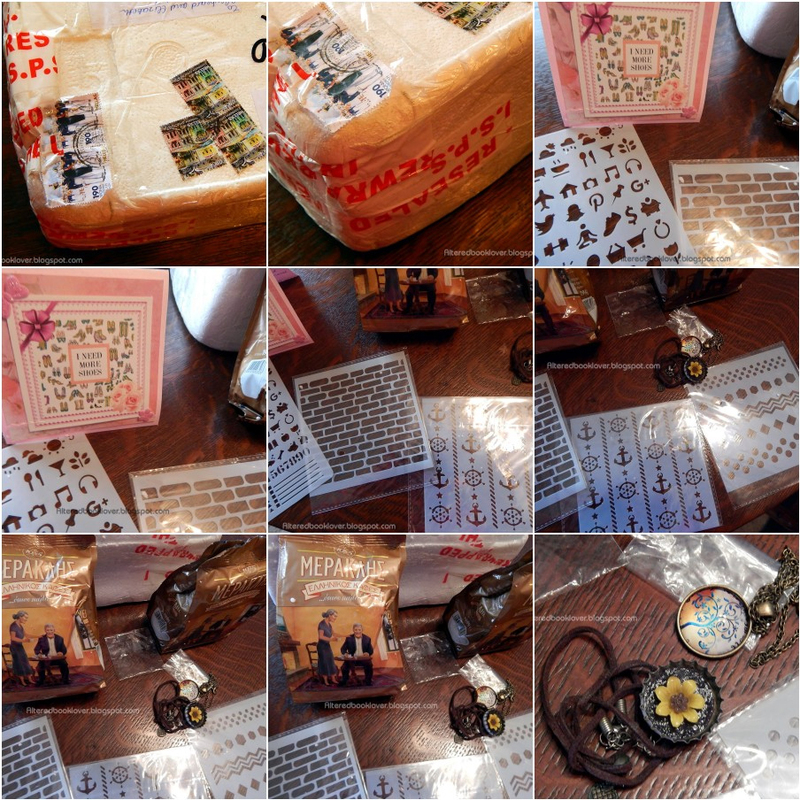 ABOUT AJJ: Contacted her already, I will let you know asap when I have everything received and ready! Beautiful gifts Elizabeth, lucky you, you certainly deserve them. WOW!!! 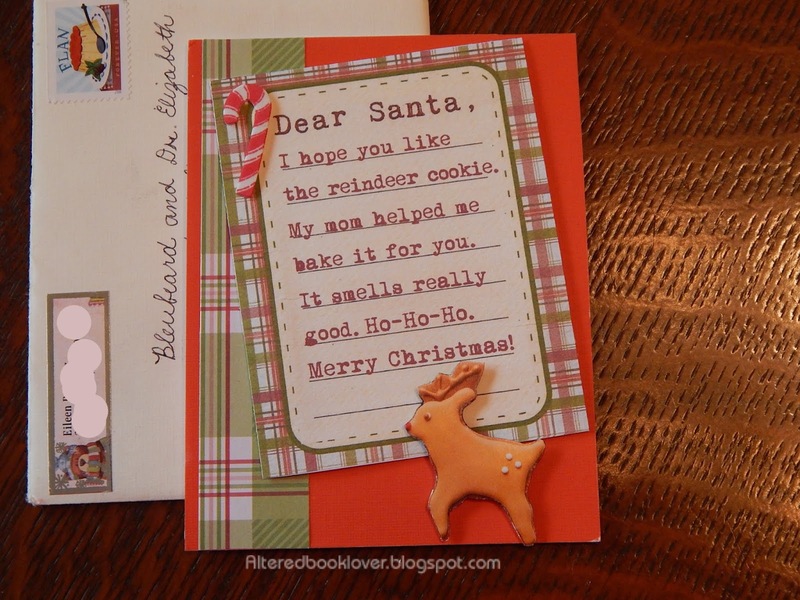 Santa -- and your friends -- was sure good to you. I LOVE what Erika made. That cup! That sewing! Excellent. Thanks for sharing so we could enjoy too. Wonderful gifts from wonderful friends!